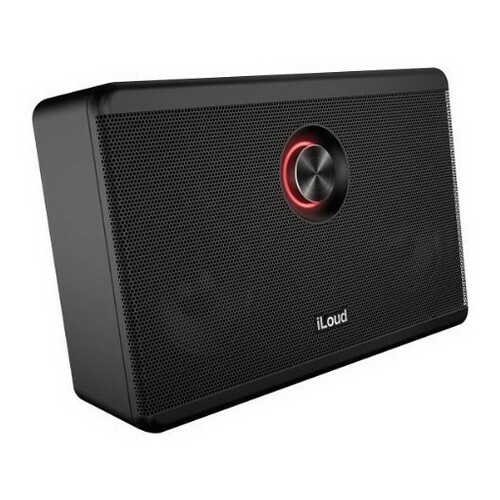 iLoud is the high-performance, battery-operated portable speaker for musicians and audiophiles. Rated at powerful 40W RMS, it provides up to five times the volume of comparably-sized speakers. Connect your smartphone, tablet, laptop or MP3 player, and get ready to be blown away. A speaker system needs to sound good at all volumes, and reproduce the music the way it was meant to sound. IK has leveraged its 16-year experience in creating tools for professional recording studios into developing iLoud's two-way, high-definition speaker system, onboard DSP, digital Class-D amplifier and high-performance enclosure. For the first time, you can enjoy studio-class sound and performance, comparable to professional monitors, in a surprisingly small package. ILoud connects via Bluetooth or to the headphone output of your smartphone, tablet or laptop. iLoud is also equipped with an iRig 1/4æ instrument input, so you can plug in a guitar, bass, keyboard or dynamic mic and jam along to your music using an iPhone, iPod touch or iPad for real-time effects processing.